I am preparing for the first workshop, which is taking place in Loughborough this evening and looking forward to meeting the people who have signed up to participate. I have fortune cookies baked and am bringing the cardboard machine again to introduce the project so we begin work on tracking climate moments. I presented the project (and fortune cookies) at the Friction Conference on Technology and Resistance hosted by the dept for Critical Theory at the University of Nottingham. The project seemed to go down very well and involved lots of discussion about how we deal with climate change as citizens and also the nature of dialogic politics – can dialogue act as a political process? On a more practical level I am also working with Matt Little on the ‘insides’ of the machine. He has built the hand crank which we tested a couple of weeks ago. 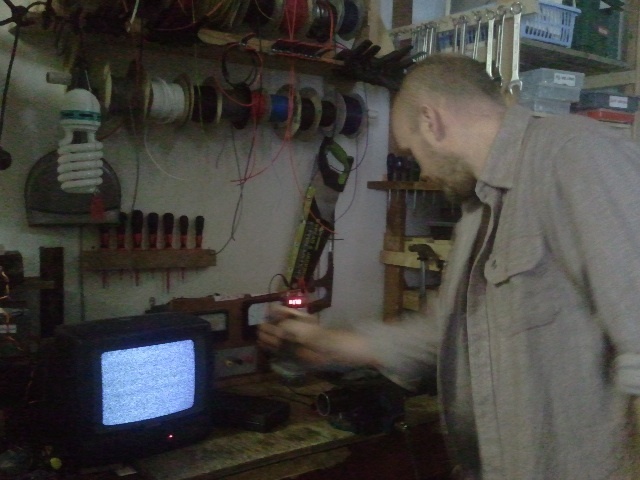 It is quite addictive, you need to turn the handle to generate enough electricity to power a CRT screen (an old telly) and speakers. This will show a visualisation of the live weather data and projected climate data, to explain how we calculate the predictions. The audio will be messages for the future about our climate that I will be working with the people who participate in the workshop on to develop. The hand crank is quite hard but if I can do it then we figure it should be possible for a wide range of people to power the screen, and it is possible for two people to work together if not. It is easy to start the power and switch on the speakers but when the TV screen switches on there is alot of resistance, this is the hard bit, it sort of kicks back and then it is quite hard to keep it going for the 10 seconds that you will need to view the screen to see the visualisation. **spolier** I am hoping the machine will give the impression that you are powering the whole thing with the hand crank when in fact we are timing it so that it looks like this – in fact the hand crank will only be able to power the screen and speakers – the computer inside runs everything else will be attached to the mains (for now) – eventually I hope to power this with solar power. The next step in the machine building is deciding which printer to get, Matt is working on the levers and dials and meanwhile Mouse and Jesse are working away at getting the weather station data into our data platform so we can send it to the machine along with our future scenarios and the data (which i’m still trying to find) for 2034. More on this to come.